Before we can begin to address long-term recovery issues and bridging the gap between relief and development, we, as a global society, must first recommit to the principles of humanitarian action: humanity, impartiality, neutrality and independence. We must affirm the right of affected people to receive assistance and protection with dignity and without discrimination in times of disaster, calamity and civil strife. Actions, based only on need, should be taken to prevent or alleviate human suffering that arises out of disaster and conflict. We must advocate for those who are providing assistance as well. Far too many people are dying in the name of helping others, and we must return to a sense of certainty that those who are committed to humanitarian responses after a disaster will be safe as they seek to offer aid. Then we must think about what aid looks like. Devastating events like the recent earthquakes in Japan and Ecuador propel many people and organizations into immediate response mode, with most resources going towards short-term relief. Often those plans do not take into account long-term recovery. The humanitarian and development sectors have worked with an artificial, sequential construct in mind for too long. We need to think more carefully from the start about preparing for what comes next. Anyone who has been in a community when a disaster strikes knows that reconstruction begins almost immediately, as families salvage what they can to secure a place to sleep that first night. Therefore, humanitarian and development organizations must learn to coordinate better, developing plans to jumpstart recovery efforts that can keep pace with local initiatives. We owe it to those impacted by disaster, and we owe it to those entrusting us with their donations to think long-term from day one. As early as possible, we should be creating plans to empower affected families to rebuild their lives, their business and their communities. With exit plans in place, INGOs should be setting local residents up for lasting success. Unfortunately, over the years we have created barriers to that success. One of the challenges lies within the way our humanitarian work is funded. Many divides exist in the process, such as fragmentation between humanitarian aid and development funding. There are also gaps related to relief and recovery activities and recovery and reconstruction plans. All this contributes to potential long delays that hinder individuals and communities from rebuilding. The funding model that creates these gaps must be changed. Those affected by crises need recovery assistance sooner rather than later, so it is crucial that development donors and actors respond more quickly. It is also critical for everyone to think about next steps and what the ultimate goals are. Something as simple as definitions can also contribute to the problem. 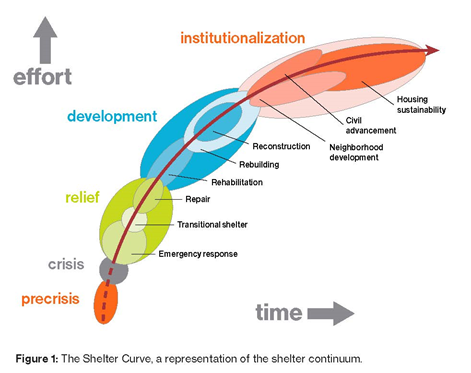 For example, some use the term “shelter” when talking about immediate relief but use the term “housing” when speaking of recovery or development. Technically, “sheltering” starts when someone is pulled from the destruction and wrapped in a blanket or jacket for protection. The sheltering process does not end until he or she is in a permanent home. How we go from a blanket to a permanent home is far from a well-defined protocol and varies by situation and context. We need funding models that can vary and flex as well. As Habitat for Humanity began assembling and distributing emergency shelter kits in Haiti after the January 2010 earthquake, the response team started looking to the next set of interventions. In coordination with the Shelter Cluster, the Habitat response team decided that transitional shelter solutions were needed by a significant number of families who were facing the upcoming hurricane season. The unavoidable question arose: Transitional shelters … transition to what? We had an end goal in mind: a safe, decent place to live. We also focused on the understanding that shelter programmes are more than houses. We looked at future vulnerabilities and sought to ensure that communities, settlements and social fabrics were built into our response. Creating stability is a vital consideration. Realizing that relocation is disruptive, difficult and an obstacle to recovery, those offering humanitarian aid must focus on restoring communities and helping people get back to their normal routines as soon as possible rather than isolating them from their familiar surroundings and coping mechanisms. Lastly, given ownership of recovery can also be a barrier to success. We must clarify who owns the recovery process. The job of INGOs is to empower community members to be the drivers of their own recovery. Local residents should lead policy-making and reconstruction efforts, which must tie into the plans and strategies of the host government. As has often been repeated in conversations leading up to the World Humanitarian Summit, our work should be “as local as possible, as international as necessary”. Habitat has adopted a strategy called Pathways to Permanence that seeks to support disaster-affected families and communities using a holistic approach and incremental housing solutions. Led by our local partners, we look to use local resources and employ local workers in efforts to rebuild communities – and entire regions. In our everyday work around the world, we have adopted a hand up, not a handout mentality. That is true in our disaster response as well. Collectively, those of us offering humanitarian aid should leverage our efforts and precious resources to bridge the gap between relief and development so we can help families create permanent solutions to the challenges they face. We must continue to bring together private, public and people partnerships to develop the most efficient and impactful solutions. What can we do to remove barriers to recovery? How can we help families as they begin to repair and improve their own housing? Can we help with land tenure issues? Can we provide technical assistance? Can we help families access microloans? Can we support entrepreneurs who provide essential goods and services for housing? Knowing that mitigation is seven times cheaper than rebuilding, can we invest in preventing destruction before disasters strike? I think the answer to all of those questions is yes, and we need to start thinking of those options, and others, as we envision the best way to provide humanitarian assistance. Given the scale of need, only collaborative efforts by all actors will enable us to accomplish our goals. We must begin recovery work as soon as possible, set in motion a plan to address long-term needs and place ownership of the recovery process into the hands of affected families , their communities and leaders.